Impress your family and friends with chocolate lasagna. 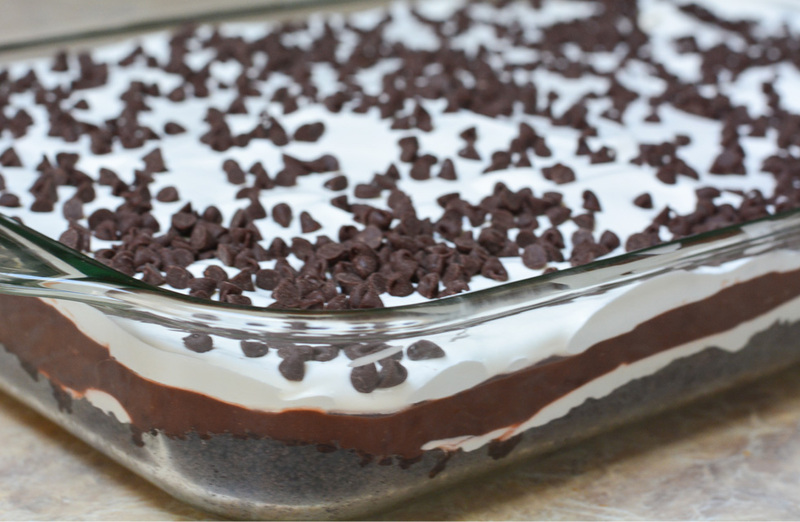 This no-bake chocolate lasagna recipe is made with layers of chocolate pudding, Oreos, whipped cream and chocolate chips. A family favorite, it’s one of our most popular chocolate desserts that we make for special occasions. 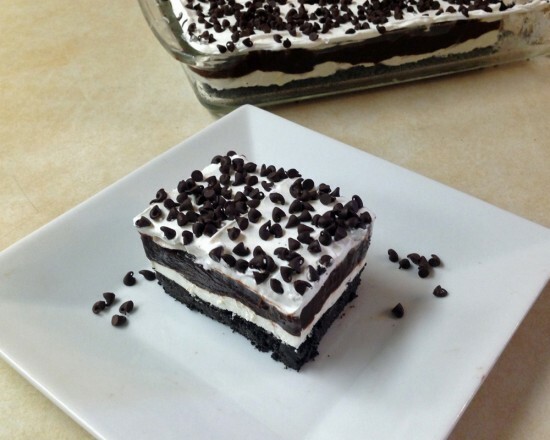 This dessert lasagna is a whole bunch of goodness packed into one slice! 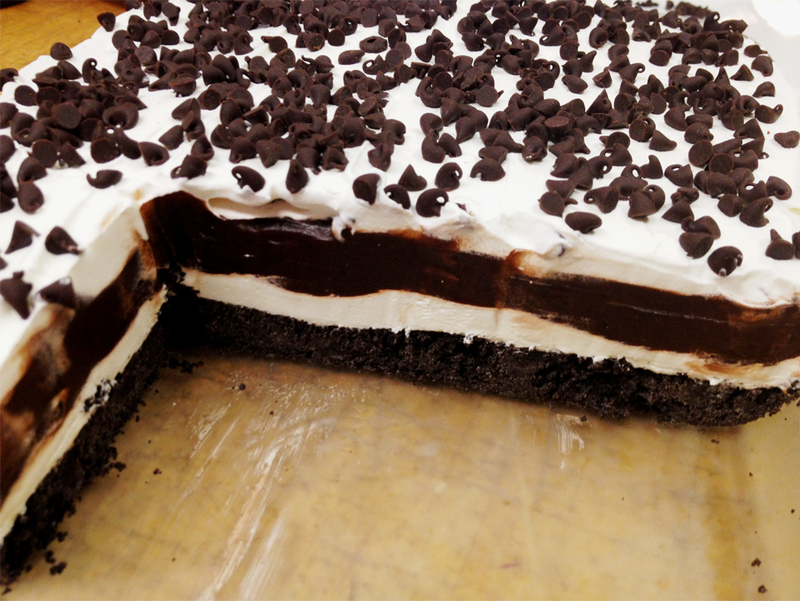 An Oreo cookie crust piled with chocolate pudding, whipped cream, and chocolate chips. With family in town a few weeks ago, it was the perfect time to make this Chocolate Lasagna recipe. I knew if I made it any other time I’d be the one indulging in the leftovers all week long. With family in town I knew I wouldn’t have many leftovers sitting in my fridge staring at me every time I opened it. The Chocolate Lasagna is a light dessert, perfect for hot summer days and is incredibly easy to make. You don’t have to be a good baker or need any special baking tools to make this top notch dessert. This recipe is made with a 9×13 dish, so there’s dessert for everyone in the family. Save this irresistible treat for your next potluck or party! First, we’ll start with the Oreo crust. To make the crust, place the Oreo cookies in a food processor and blend until finely crushed. If you don’t have a food processor, place the oreo in a bag and crush. You can also use a rolling pin to break the oreos into small pieces. Place the fine crumbs in a large bowl. Mix in 6 tablespoons melted butter. Dump the oreo crumb mix in a 9 x 13 inch baking dish and press the crumbs evenly in the bottom of the dish. Mix the cream cheese with a mixer until light and fluffy. Add in 2 tablespoons of milk and sugar, mix well. Stir in 1 1/4 cup Cool Whip. Spread this cream cheese mixture over the crust. Now it’s time for the chocolate pudding layer. In a bowl, whisk together chocolate instant pudding with 3 1/4 cups cold milk until the chocolate pudding thickens. Use a spatula to spread the mixture evenly over the cream cheese layer. Place the chocolate lasagna in the freezer for 1 hour, or the refrigerator for 4 hours before serving. How many does a 9×13 dessert feed? This chocolate lasagna serves between 12-15 people. Each serving size is about 1 cup. White Chocolate Lasagna – golden oreo crust, substitute chocolate pudding for vanilla pudding, and top with white chocolate. Oreo Lasagna: Swap out a package or both of the chocolate puddings for Oreo instant pudding. You don't want to miss out on this super easy no-bake chocolate treat. It's sure to be a keeper and will leave your friends and family asking for the recipe. 2 3.9 oz pkg Chocolate Instant Pudding. This super easy no-bake chocolate treat is sure to be a favorite and will leave your friends and family asking for the recipe. It’s served cool – right from the fridge (or freezer)- a perfect chocolate dessert for those warm summer days. Oh, boy… that looks sooooooo good. I think I gained 10 pounds just looking at it! This is precisely what the doc ordered!! Yummy for the Tummy!!! This is a real keeper, I would love to make this for the next get-together! Are you serious??? I HAVE to have this!!! Im going to be a superstar when I do too!! this reminds me of an old recipe i have called striped delight, only it sounds a little better! Looks yummy – dessert for tomorrow night! You’d have four out of five takers in my house (hubs is not a huge chocolate fan). It looks relatively easy to make, too, which is always a plus. This looks amazing! My family would love this dessert. This looks wonderful. Because it is no bake… the grandkids can make it all by their self’s. What a great idea. Wow! I’m going to have to try this…though like you I’ll wait for company as otherwise I’d eat way too much of it. Wow!! This looks so good and the presentation is really nice too! This looks so good and I know my grandchildren would just love it. I’m going to have to surprise them soon with an after dinner dessert. That looks divine! And so easy to make! Thanks for sharing the great recipe! Great idea! This looks tasty! I made this over Christmas and used Cool Mint Oreos and chopped up Andes Mints instead of chocolate chips – it was a massive, massive hit. I think we’ve found a new Christmas dessert! Yum! This recipe is definitely drool-worthy! Who could resist something like that??? This recipe looks so delicious! 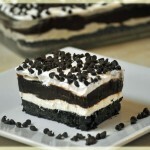 I want to make this awesome Chocolate Lasagna. Thanks for this terrific recipe! This looks tasty. All i need is the whip cream. I’m really craving chocolate right now, so this looks amazing! Here I go again craving chocolate and then I see this on your blog. I have to make this for my family as it looks so delicious. This is such a cool idea! I have enver heard of it like a lasgna but that makes total sense! Now that is a lasagna I can see myself eating every day, and I would not share it with anybody. Freezing it the night before an event make si teven yummier! Freezing it the night before the event makes it even yummier! That looks like a really chocolate-y treat, which is always a big plus! I need to try this one. I love chocolate so this looks so good to me! Awww, use this recipe every.single.time and it is always a hit. My layers are never as nice as the photo. I will go down one pan size and see if that helps.